During this time of great uncertainty and fear for so many, all of us at Welcoming America stand shoulder to shoulder with you in our belief that welcoming must be an essential part of our collective future. Making sure all Americans – including immigrants – are able to participate fully in our communities will lead to greater prosperity for everyone; and it is also simply the right thing to do. Although the national winds are unfortunately shifting away from welcoming immigrants and refugees for the moment, on the local level, the conditions that have led our movement to grow at a remarkable rate over the last several years have not changed. Cities and towns from the industrial Midwest, to the Mountain west, and beyond, recognize the countless benefits that immigrants and refugees bring to their communities, and also acknowledge their moral responsibility to stand up for their newest neighbors in a time of scapegoating, fear, and increased incidents of hate. We at Welcoming America pledge to do more than ever to support our valued member communities, and immigrants and refugees experiencing fear and intimidation that may soon be targeted by new, draconian federal policies. We also continue our commitment to support long-time residents of communities who are experiencing rapid demographic change as a result of local immigrant growth. Change is best managed collectively, and we want to make sure all voices are heard when communities come together to envision a brighter, more inclusive future. 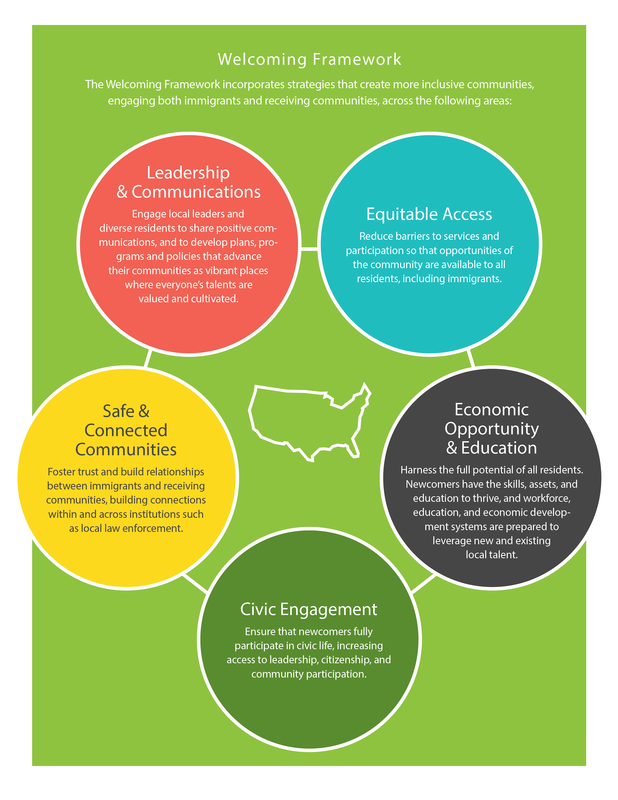 Support communities in the Welcoming America network and beyond to promote the establishment of more inclusive community climates, as well as policies and programs that ensure everyone can reach their full potential. Help community efforts to defend the rights and well-being of immigrants and refugees, as well as to support communities working to counter hateful rhetoric and actions. Step up efforts to lift up the contributions new Americans make to towns and cities across the country. Increase support to communities experiencing rapid growth in immigrant and refugee populations to build understanding with long-time residents and find common cause. Welcoming America will be there to help these places turn fear into understanding and to build connected communities that work for everyone. Welcoming America is here for you: Please reach out anytime if your community is facing a challenge or threat to welcoming, if we can help you deepen your efforts, if you have an innovative practice that may inspire others, or if you have a story of people coming together to find common ground during these extraordinary times. We want to lift up and support your efforts. Let’s work together to make America the welcoming place we know it can be. Let’s roll up our sleeves and all become champions of welcoming. Now is the time. The last few days have been difficult for so many in our country. To the one in four Americans who is an immigrant or the child of an immigrant - this is your home, you belong here, and we fight alongside you. To families who fear being torn apart by deportations - our country must be better than that. To the refugees who fear being sent back to grave danger - we cannot allow that to happen. To Americans of all identities - we must work together to make sure this country continues to be for all of us. And it all starts right where you are: in your community. Each of you has been an advocate, champion, and leader as you work to ensure all your neighbors can feel they belong and have equal opportunity and treatment. We are grateful to be united with you around a shared sense of purpose and want to help you. If you live in one of the 100+ communities in the Welcoming America network, please reach out for opportunities to help in your neighborhood. If you don’t, feel free to contact us so we can help you move your community forward. If you want to take personal action, we encourage you to find ideas through our #3waystowelcome series: welcoming in your neighborhood, welcoming in your school, and more to come in your inbox. We can also help build bridges at this critical time in history. Our country is more polarized than ever, but we can move beyond this. We can show all people that our differing identities are actually assets in making our communities and nation stronger - that our immigrant and refugee neighbors are our friends and partners. This will mean sitting down with long-time residents who may feel they themselves are becoming strangers in their own communities. Here are some initial tools to help you get started. We are rolling up our sleeves and getting back to work. Our movement is just getting started, and it will continue to grow and strengthen, community by community. But we cannot do it without you. We need your support now more than ever. There will be a day when every place in the United States is welcoming to all people. Together we will make it so. Christina Pope speaking at International Forum on Reception and Integration of Refugees in the European Union. Christina recently spoke on behalf of Welcoming America at the International Forum on Reception and Integration of Refugees in the European Union, hosted by the Public Diplomacy Council of Catalonia and the City of Barcelona. This gathering of government and community leaders, practitioners, and policymakers was held to exchange ideas and best practices about integration, inclusion, and the role of local governments and NGOs in migration policy at a time when more people are displaced since World War II. We heard from an impressive group of speakers who described an outpouring of support for those arriving from Syria through efforts undertaken by local governments, community institutions, and individuals. Oriol Amorós, Catalonia’s Secretary General for Equality, Immigration, and Citizenship, stressed that reception and integration happen at the local level – a familiar theme to those working locally in the United States. Indeed, the day was filled with examples of European cities that have laid out the welcome mat, creating initiatives large and small to address the immediate needs of newcomers and help them integrate within their new communities. I was honored to join an NGO best-practice panel, where I was floored by the scope of efforts of projects such as Mediterranean Hope, which among other services, simply provides internet access so asylum-seekers can speak with their families in Syria for the first time after journeying to the island of Lampedusa, Italy. Many cities are engaging receiving communities (those residents who have lived in a community for some time) to ensure that newcomers are arriving to fertile soil-- that is, to fight discrimination and help build mutual understanding and respect between long-term residents and new neighbors as demographic change occurs. Contact Building: At the Danish Centre for Gender, Equality, and Diversity, Beatriz Hernández de Fuhr coordinates a mentor network that pairs women with mutual interests who create a set of goals to work toward together—an excellent tool for the first of three strategies often used among our membership network: meaningful contact building. Positive Communications: Lola López, Barcelona City Council Commissioner for Immigration, shared a powerful example of the second strategy often used, positive communications. Barcelona’s model “Anti-Rumor” public service campaign dispels misconceptions that some locals had about immigrants. The campaign has been replicated in more than 15 cities that use trained anti-rumor “agents” such as street theater, media campaigns, and more. Leipzig is in good company; from Paris, France to Helsinki, Finland to Wadowice, Poland, local government officials have shown extraordinary leadership across Europe in the midst of an ever-changing situation filled with both opportunities and challenges that are testing European values. According to the Mayor of Barcelona, Ada Colau, current migration flows present an opportunity to return to Europe’s foundational values, and, “if Europe doesn’t return to its founding principles on this issue, then it will be definitively lost.” Time and again, speakers returned to “core European values,” identifying characteristics like freedom, equity, and human rights. Barcelona’s own identity as a city intertwines with migration – government leaders referenced how more than 200,000 people fled Catalonia due to fascism, and these leaders now feel a moral responsibility to welcome refugees. This common thread – one of many I noted between inclusion efforts in the U.S. and in Europe –was a reminder of the value of transatlantic opportunities to exchange ideas and best practices, whether at the Welcoming Interactive in Atlanta or this forum in Barcelona. I return to the United States feeling grateful for champions of immigrant inclusion worldwide, as well as for our vibrant Welcoming America network which shares best practices, builds capacity, and inspires change. Cities don’t just become great, and then people move there – they become great because they intentionally design themselves to be places that attract and incorporate diverse people, ideas, and talent, and ensure that their residents, regardless of background, can participate, thrive, and belong. This past week, I had the opportunity to speak at the Third International Cities of Migration Conference in Toronto, hosted by the Global Diversity Exchange at Ryerson University. A gathering of local government and community leaders, practitioners, experts, activists and policymakers, the event was an opportunity to explore themes of diversity, prosperity and migration at a time when these issues are at the forefront of international discourse and policy. The roster of speakers was impressive and, speaking from an American perspective, provided an inspiring glimpse into Canada’s compassionate response to refugees. We heard from Canada’s new Minister of Immigration, Refugees and Citizenship, The Honorable John McCallum, who spoke about the federal government’s significant commitment to resettle Syrian refugees, and the fact that this was a national project of great importance – one that would be lived out in cities large and small, in partnership with government, civil society, businesses, and local residents. I had the pleasure of joining a panel on Welcoming Refugees, where I was inspired to be surrounded by some of the entrepreneurial efforts being led by Canadians - efforts like Lifeline Syria in Toronto, which is working to recruit, train and assist sponsor groups as they welcome and support Syrian refugees coming to Canada. This entrepreneurial and pragmatic spirit of welcome wasn’t limited to the Canadian experience. Wolfgang Spelthahn, District Mayor of Landrat, Kreis Düren, Germany, spoke about efforts in his city to create a welcoming culture, and – as a city with a declining population – the demographic imperative of doing so. Indeed. Cities don’t just become great, and then people move there – they become great because they intentionally design themselves to be places that attract and incorporate diverse people, ideas and talent, and ensure that their residents, regardless of background, can participate, thrive and belong. If cities fail to grow without immigrants and inclusion, than they certainly can’t grow without the concurrent growth of the organizations and champions who engage on this issue. That means we need an abundance – not a scarcity – mentality to not only be our guiding view on migration, but also our lens for how smart migration gets managed in cities. As local welcoming efforts are proving, communities can grow their capacity to meet the short-term challenge, and prosper from the long-term benefits. We’re often told that we should be doing more with less, but in this case, it’s all about doing more with more. More resources, more partners, and more recognition of the importance of migration in shaping the social and economic destinies of cities around the world. And as the field of immigrant inclusion widens to encompass the globe, it’s conferences like this one that show just how much we can accomplish when good ideas travel.